Is it just me or is anyone else a little blue after a big, more than a weekend long, regatta? Maybe it is similar to the post vacation blues—back to work, back to the battle against the constant mess that is my parenting life, back to all the stuff that I have to do on top of all the stuff I want to do. I think it is a little more intense than that for me. I think racing sailboats is my drug. When I have to stop physically, I can’t stop thinking about it, can’t stop thinking about how to get faster, can’t stop thinking about what event is next. Also, I miss my racing friends who I only get to see at regattas and I miss my team. It’s a bit like being a kid and going to a summer camp—having an incredible time with your buddies for four or five days and then needing to go home. You’re happy to see your family, but you miss camp. 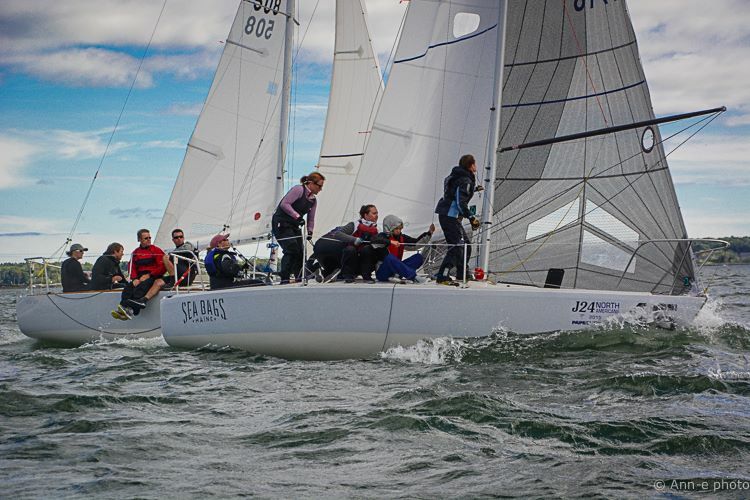 For me, the blues after finishing the 2016 J/24 North Americans and the J/24 East Coast Championships are a little more intense than most events. Coming home with a broken rib from the NAs meant dealing with the repercussions of an injury that couldn't be ignored. Knowing that I wouldn't be able to exercise for awhile, that I needed a ton of sleep, and that Side Hustle, our other J24 was out of the water, which was a good thing because I couldn't sail her until I healed anyways, all made me a little sad. Plus, summer had ended—god I love summer. I’m not sharing this to get sympathy, I’m sharing to possibly acknowledge something we all, or some of us, go through. So, on that note, I’ll be took big deep breaths regularly, so I didn't get pneumonia and slept lots. To get ready for the next event the ECCs. After the ECCs the Post Regatta Blues were back and winter has started to set in here. Maine's winter is a bit longer than most places and waiting until the next event in the spring is a challenge. So sail on our southern friends and hope to see you all in 2017 at the next great J/24 event! And on that note here are some photo highlights of the year to keep us all going from our team.